Almost any vegetable can be roasted using the same method. The approach of fall weather brings to mind classic comfort foods, warm from the oven. Roasting vegetables is one of the easiest ways to get delicious fall flavors reflecting the season, direct from your local farmer to your home table. Roast them, uncovered, until they are fork-tender and nicely browned (how long depends upon the vegetables being roasted and the size of the pieces). Be sure to flip them half way through baking so they brown evenly on all sides. Cabbage: Cabbage gets a lot of love via coleslaw and stuffed cabbage rolls, but try roasting cabbage on its own for a simple and delicious side. Green and purple cabbage can both be roasted; slice either into “steaks” about 1 to 1 1/2 inches thick and place directly on a cookie sheet, drizzling each slice with oil and your desired herbs and spices. After roasting at 425F until fork-tender (about 20 minutes), use a spatula to transfer the roasted and caramelized cabbage steaks to each plate and enjoy! Celery root, or celeriac, is best roasted for ultimate flavor. 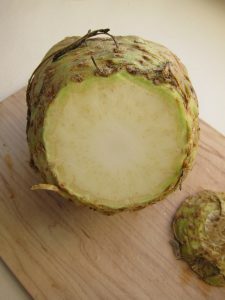 Celery Root: It’s not uncommon to find people who have never tasted celery root, also known as celeriac, because it is frequently missing from the shelves of most grocery stores. But this farmer favorite has the flavor of well-loved celery with the added bonus of a creamy undertone. Roasting it is the best way to elevate this modest root vegetable to culinary heights. And if you’re still feeling a bit hesitant, try roasting celery root with well-known carrots, as described in this recipe for Roasted Celery Root with Sweet Carrots. Eggplant: Eggplant is an under-utilized vegetable. It’s available in a multitude of varieties, from thin and lavender colored to round and pink with white stripes. While the flavors vary subtly, the overall deliciousness of eggplant is reliable. Roasted eggplant takes on a sweetness that is frequently missed in typical eggplant recipes, such as the complicated eggplant Parmesan. Instead, roast local eggplant with New Mexico green chiles for a flavorful addition to your table. Try this recipe for Honey-roasted Green Chiles with Eggplant. 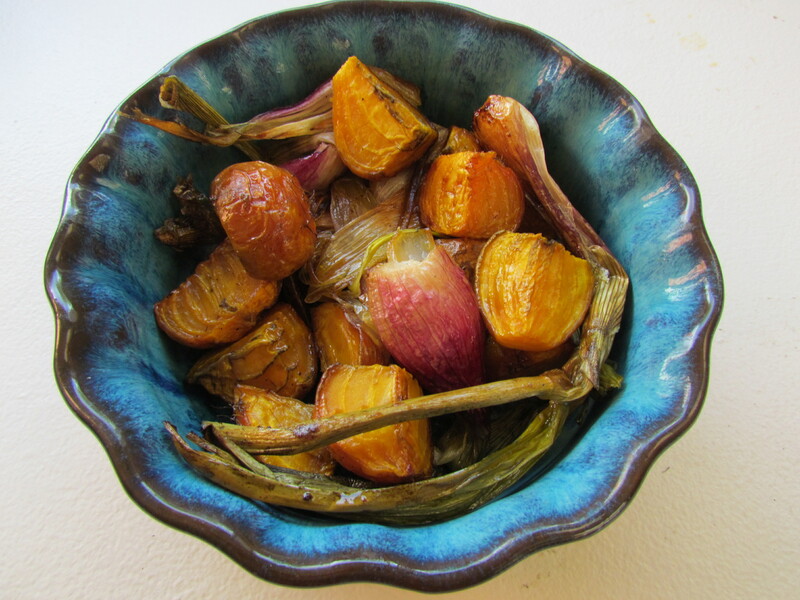 Roasted fennel takes on a subtle and sweet flavor. 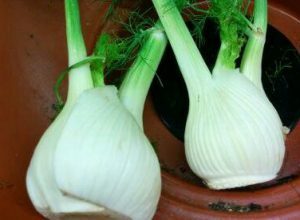 Fennel: With its slight licorice taste when raw, fennel can cause uncertainty among home cooks who aren’t quite sure what to do with it; roasting the vegetable provides a subtle sweetness that removes much of the licorice taste and allows fennel to blend well with roasted meats. Remove the green tops and slice into wedges before roasting. It mixes well with other vegetables like potatoes, or can be roasted on its own and sprinkled with lemon juice and Parmesan cheese before serving. Garlic heads: Garlic can be roasted by simply slicing the top off the whole head, paper and all, exposing the tops of the cloves within. Roast garlic heads with other vegetables, making sure to wrap them in aluminum foil after they’ve been drizzled with olive oil, salt, and pepper. When roasted the cloves become soft and buttery; remove them with a fork and either eat straight or smear on toasted bread or crackers. 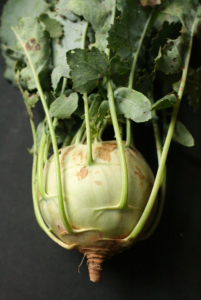 Kohlrabi roasts well and is delicious simply served with butter and salt and pepper. Kohlrabi: Broccoli, cabbage, and even radishes are vegetables commonly used to compare to the taste of kohlrabi. But in truth kohlrabi tastes like kohlrabi, and it deserves to come into its own as a reliable fall and winter vegetable for the home table. When roasted on its own or with other vegetables (eggplant makes a nice taste accompaniment), the flavor mellows and caramelizes like other vegetables. Serve with butter or olive oil, and salt and pepper. Onion: Any onion can be sliced and roasted, and onions frequently make an appearance with combinations of roasted vegetables such as potatoes and carrots. But to get the best flavor from roasting onions, simply cut them in half before tossing them with oil and herbs and spices. Be sure to roast them cut-side down with your other vegetables. 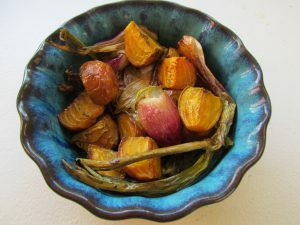 Roasted onions turn into sweet nirvana, and they can be used to enhance other dishes for your table or eaten on their own with salt and pepper, and herbs such as thyme and oregano. Squash: Any squash can be baked, including pumpkins, which seem too often relegated to the inside of a pie. While there are a myriad of uses for summer squash (read about them here and here), roasting them in fall brings out the same flavor that enhances other vegetables. And fall brings to the table winter squash, which are sometimes summer squash that have matured to the point where their rinds are hard and inedible. Slicing or chopping them for oven-roasting in fall provides another reason squash form part of the culinary trinity along with corn and beans of indigenous peoples. Try out this recipe for a Quick & Easy Fall Burrito Bowl. Roast smaller turnips with their skins on, but peel older turnips before roasting. 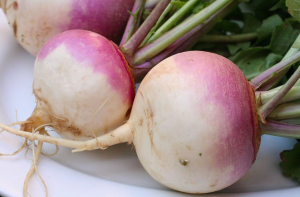 Turnips: Turnips are a root vegetable just like potatoes, and the taste can sometimes be confused with potatoes…sort of. But when roasted to fork-tender perfection, the taste of turnips outstrips the blander (though delicious) potato. To get the most out of roast turnips, peel them if they are older and larger; smaller and younger turnips can be roasted with their skins on. After they are soft and roasted, serve them with butter and salt and pepper; this simple presentation is all they need. Roasting is easy and transforms local vegetables into nuggets of tender, caramelized sweetness. Thank you for this great list, the great pictures, and directions, and for making this print out so nicely. You’re very welcome, Lynn! Thank you for reading and commenting! Thank you for this! for the list, and for how to do it. I’ve not done this kind of cooking, but I’m going to try it and appreciate very much you’re telling us how to do it. Thank you, again! Thank you for the information. 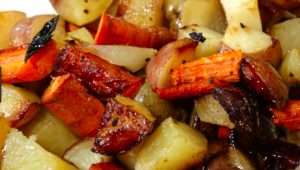 I love roasted veggies but haven’t tried many of the ones you mentioned. They sound delicious! I’ll be trying some tomorrow. Great! It’s always fun to experiment! These sound so savory and really foster a autumn atmosphere. Thanks for the ideas.